Say no to taxpayer funded handouts to big coal. Two versions of the same bad bill (S.B. 155, H.B. 239) are receiving hearings in the Ohio General Assembly, and could pass the Ohio House before the end of the year. If these bills pass, Ohioans will pay a surcharge on our electricity bills with no limit on how much or for how long these utilities could collect and pocket our hard-earned cash. Low income families and seniors living on a fixed income wouldn’t even be exempt. That is just plain wrong. We need your voice to help us squash this taxpayer funded handout to big coal. Send your legislators a message, today! Utility interests want to force Ohioans to pay for their bad business decision. In 2011, a group of utility shareholders decided to invest in coal-fired power plants at a time when cheaper and cleaner resources were gaining a strong foothold in the Midwest. These utilities decided to take on the risk of coal despite a shifting energy landscape, and locked themselves into these coal plants until 2040. Now, these utility interests are realizing their mistake and want to force Ohioans to pay for their bad business decision. Send messages to your legislators, today! 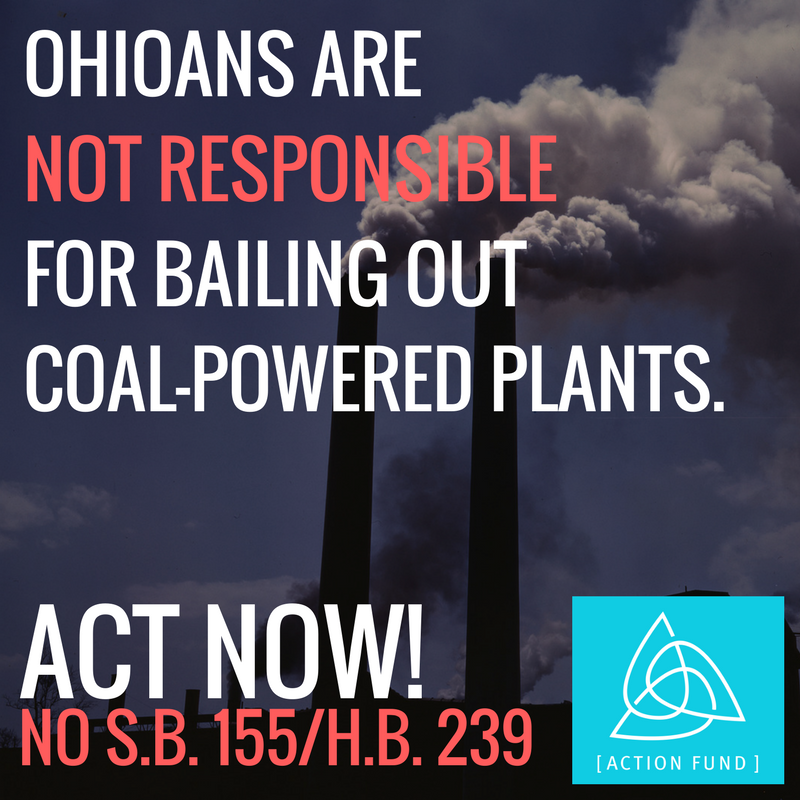 Tell them they cannot charge Ohio families in order to prop up dirty, failing plants. Consumers are not responsible for big corporations’ bad business decisions. Take a moment to personalize the message below. This will make your action more effective. Subject: NO to S.B.155/H.B.239: Ohioans should not have to pay for Ohio Valley Electric Corporation's bad business decisions. As a hardworking Ohioan, I go to great lengths to budget and make prudent financial decisions for myself and my family. Why should we not expect the same behavior from corporate utilities in Ohio? If I were to make a bad choice to invest in fax machines at a time when everyone else was moving towards cloud computing, how could I reasonably ask you - as an Ohio policymaker - to bail me out when I lose a ton of money on my fax machine investment? <br><br>Senate Bill 155 and House Bill 239 essentially propose such a scenario - awarding money to entities that have made a poor choice. The joint utility shareholders of the Ohio Valley Electric Corporation (OVEC) which are AEP, FirstEnergy, Duke and Dayton Power & Light stand to receive a huge windfall if these bills become law, but at the expense of all their customers. And for what? To prop up two jointly-owned coal fired power plants - Kyger Creek in Cheshire, Ohio and Clifty Creek in Madison, Indiana. How does it makes sense that an Ohioan would pay to prop up a plant not even located in Ohio? <br><br>Senate Bill 155 and House Bill 239 comes at a huge cost: $256 million per year for the next 23 years! That’s approximately $420 that I will have to pay, eating into my budget for all the other household expenses.<br><br>Senate Bill 155 and House Bill 239 prevents Ohio from moving forward, and locks Ohio electric consumers paying for coal-fired power plants that should be headed for retirement by now. If these bills become law, Ohio electric consumers would be bailing out these uncompetitive coal plants until these plants are 85 years old!<br><br>These bills keep us stuck in an energy past, would increase my electric bill but provide no additional benefits to me as a customer, and would reward corporate utilities for bad business decisions they made on their own. As their customer, I should not be responsible for propping up failing investments of Ohio utilities. For these reasons, I urge you to VOTE NO on Senate Bill 155 or House Bill 239. Ohioans shouldn't have to foot the bill for bad business decisions. We cannot continue to prop up dirty coal-powered plants. Send a message to your legislators asking them vote no on S.B. 155/H.B. 239. Ohioans shouldn't have to foot the bill for bad business decisions. We can't prop up dirty, old coal. My message to #OHLEG: NO SB155/HB239! We are unable to direct you to our action page using the information provided, but you can still take action by calling Ohio Senators and Representatives about this important issue! Thank You! Will you take your action one step further? We need as many Ohioans taking action on this fast-moving bill as possible. Share this page with your networks and urge them to take action NOW! Our work would not be possible without donors. Please join our Founding 500!